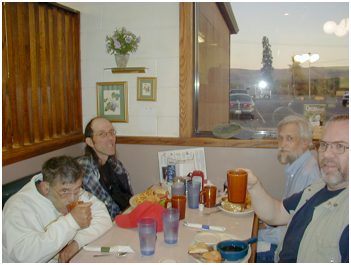 In late 2007 after Dad went Home I was sitting with Vern in Dennys. We were doing what we had done for decades, drinking coffee and talking about anything. I began to think about this over the next few days and weeks. On another day at Dennys Vern and I were together again and I started to bring up the idea that the Lord had whispered in my heart. “Vern” I said, “what do you think about getting together with Bill and saving twenty dollars each month. After a year we’ll have enough money to buy a Mac Mini for our Sister as a surprise gift?” He agreed that it was a good idea. Later on the three of us met at Dennys and discussed the idea and we all agreed to save twenty dollars each a month for one year. I did some quick math. Twenty times three, that’s sixty, times twelve, that’s seven hundred twenty; just enough to buy a brand new Apple Mac Mini computer. Later on a mutual friend was at Dennys, and I begin the share with him the idea of saving money each month to give as a lump sum gift to a recipient. He liked the idea, and was interested in hearing more. 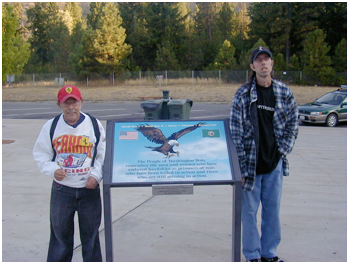 In September of 2008 these three Brothers and I went on a road trip to Ellensburg. During that time I shared with everyone about the savings idea the Lord had given me, and how I thought it could be more than a one shot deal, but that it could happen every year, and that we could choose different recipients each year to be surprised by a gift of some kind. They all liked this idea as well, and we formulated a plan to meet to discuss it later on at Dennys. During this trip I had my camera with me and took pictures along the way. We drove all the way to Yakima from Ellensburg and then went home. Later on I was reviewing the photos I had taken on the road trip to Yakima. While doing so I found two pieces of software on my Mac computer, one called iMovie and the other iDVD. I wanted to see if I could make a slide show using the pictures I took. In the course of using iMovie and iDVD, I learned that one could edit in an opening screen with a headline. At the same time I was trying to think of a humorous name for the production. I thought of this and that, but Motley Crue kept coming to mind. Of course that name was already taken. Then a “flash of brilliance” struck. How about “Motley Janitors?” It made sense since Vern and one of the two other Brothers and I had all been janitors at one time. And the four of us on the road trip were certainly a “motley” bunch. So when I burned the DVD I used the phrase in the headliner, “A Motley Janitors Production”. I little later as I was thinking about the gift giving I realized that it was becoming sort of organized, and perhaps becoming a living organism, or Body of Christ. And it made sense that it needed a name. I suggested to the group that we call ourselves “The Motley Janitors” to help identify who we were to the recipients of the annual gifts. And so the Motley Janitors was born. As of the end of this year, by the Grace of Jesus we have saved and blessed four individuals in as many years, and with around the same amount of money, about $800.00. Praise God and His Son for His way cool ideas.